Although the subject of Fort Hunter has been covered a number of times in the TWIPA blog, research conducted over the past year indicates that there was more going on in the area of Fort Hunter than was previously known. Prior to becoming the French and Indian War post of Fort Hunter, this area was known as “Chambers’ Mill” or “Chambers at Paxtang”, named for its early occupants, brothers Robert, Joseph, James, and Benjamin Chambers. Eventually, the brothers moved across the Susquehanna River except Joseph who operated a grist mill as well as possibly a gunsmith/blacksmith shop on the property. Chambers’ Mill appears to have become a widely-known location utilized as a gathering place starting soon after the Chambers’ initial settlement. In 1744, the murder of several white men, including the trader John Armstrong, by the Indians occasioned a meeting of John Harris and other locals “at the House of Joseph Chambers in Paxton” who “there Consulted to go to Samokin [Shamokin], To Consult with the Delaware King & Secalima [Shikellamy] & their Council”. Again in 1744, a council for the Lancaster Treaty brought a large number of the Six Nations natives to the area to consult with the governments of Pennsylvania, Maryland, and Virginia. Conrad Weiser met these Indians and brought them through Paxtang on their way to Lancaster City. On June 16th, 19th, and 20th he purchased supplies at Chambers’ and from Simon Girty, Sr., an unlicensed trader who is known to have traded at Chamber’s Mill. 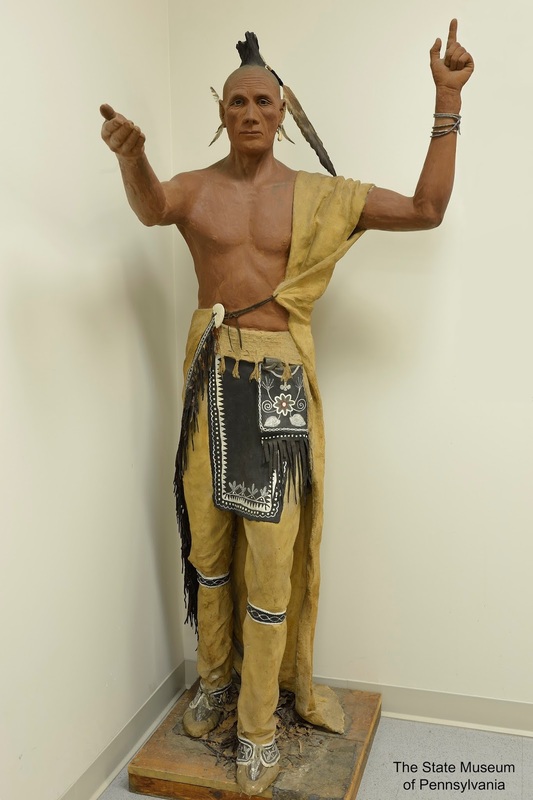 Weiser’s journal indicated that he purchased “three hundredweight of flour from Joseph Chambers and five Shillings worth of Bread and Milk of Simon girty” as well as a steer, rum, and tobacco to feed and entertain the Indians. In the summer of 1747, Weiser, passing through the area on his way north, “found Shickelimy at the house of Joseph Chambers, in Paxton, with two of his sons and a man of note from the Canickquon Country.” Weiser “stayed two days and two nights at Joseph Chambers with the said Indians, discoursed with them, and I entertained in the best manner I could”. Other noted visitors to Chambers’ Mill in the 1740s included the Indian missionaries David Brainerd, Anton Schmidt, and Bishop John Christopher Frederick Cammerhoff. Other than foodstuffs, alcohol, and tobacco, it is unclear what was being traded at Chambers’ Mill but it is likely that Joseph and his son James were also conducting trade. Following James’ death in 1763, an inventory of his belongings listed tomahawks, brass kettles, cloth and thread, matchcoats, Indian shirts, handkerchiefs, “2 Silver Hair plates” and “2400 Black Wompum” indicating the likelihood that he was engaging in trading activities with the natives. In 1764, a letter written from Fort Hunter to James Burd references Dennis McCormick’s desire to “dispose of all ye Hyds” that McCormick has at the fort. This indicates that animal skins were possibly being traded for goods here. A number of other trade locations were available in the vicinity of Chambers during this period. John Harris at Harris’ Ferry (later Harrisburg) and John Carson were located just to the south, while the Armstrong’s and Thomas McKee had trade posts to the north along the river. Whether it was to trade, to bring grain to the mill, to attend a council, or to visit the smithy for gun repairs, it is clear that something was drawing the natives to visit Chambers’ Mill. 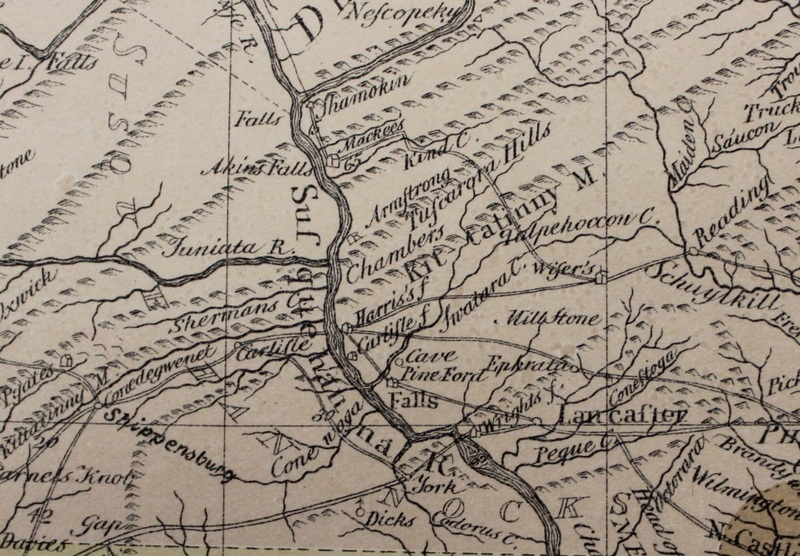 On his 1748 trip to Shamokin, Bishop Cammerhoff notes that he and his companion overtook two Indians in the woods “who lived fifty miles above Shamokin” who were “returning from Chamber’s Mill”, indicating the distances that some went to get to the mill location. It is likely that Samuel Hunter, for whom the fort was known, was also trading with Indians at the property. 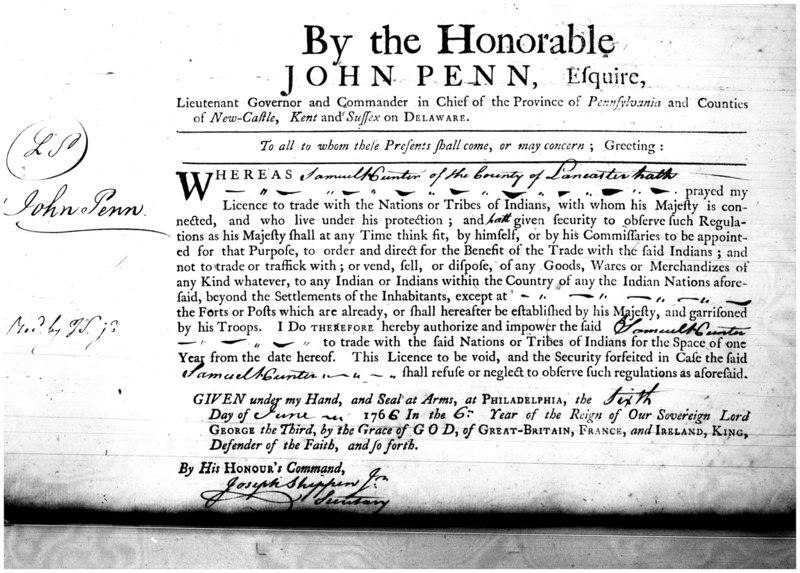 A trade license was issued to Hunter for the year 1766 that gave him “Licence to trade with the Nations or Tribes of Indians, with whom his Majefty is connected, and who live under his protection…” A licensed trader was required to give bond of £100 at a quarter session of county court, allowing him to set up a legal trade at government forts or posts. 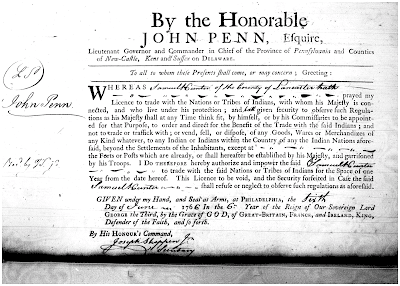 Although 1766 was the only year a license is known to exist for Hunter it is possible he was trading with Indians at Fort Hunter during the war. Although no definitive account of the types of goods being traded at Chambers’ Mill has yet been discovered, a number of artifacts recovered from the site indicate the possibility of a link to native visitations. Eighteenth century glass trade beads and cut scrap brass, prized by the Indians for ornamentation, have been found during excavations. 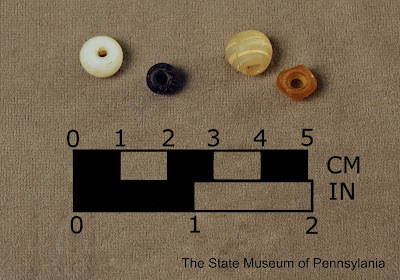 In 2015, four glass trade beads were recovered from newly-opened test units on the east side of the back porch, as were fragments of brass and brass ornaments. Gun parts recovered from the site could be associated with military activities at the fort but may also reflect pre-war use of the smithy and could represent native weapons brought in for repair. This could be one reason that Indians were traveling long distances to visit the site, as the Moravian smithy at Fort Augusta was not constructed until the winter of 1747-48. 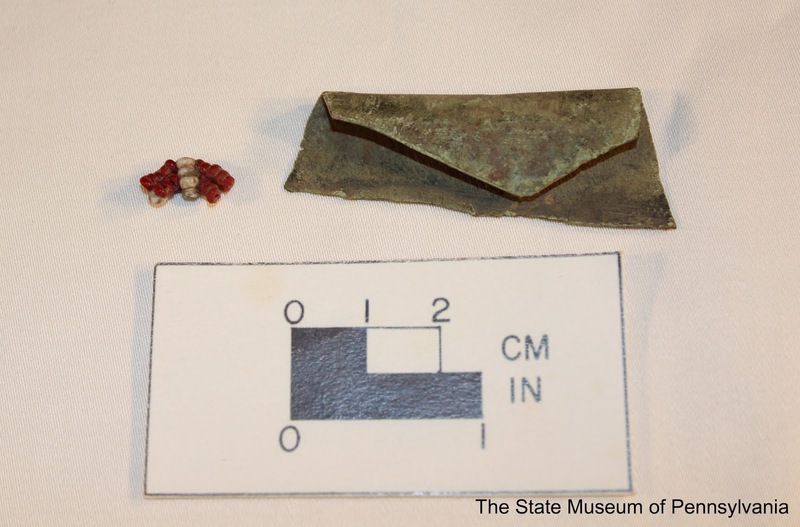 Other items that have been found at the Fort Hunter excavations, such as knives, combs, scissors, buttons, straight pins, and mirrors could represent trade goods as easily as objects associated with the military occupation or even household goods of the Chambers or Hunter families. More documentary research and comparison of the collection will need to be undertaken in order to detail the nature of the objects recovered from Fort Hunter. A more careful inspection of the entire collection may reveal that objects thought to have been associated with the fort occupation are possibly instead related to trade activities. Through such work it is hoped that a better understanding of the early trade and Indian relations at this site will emerge. Cammerhoff, Bishop John Christopher Frederick and John W. Jordan 1905 “Bishop J.C.F. 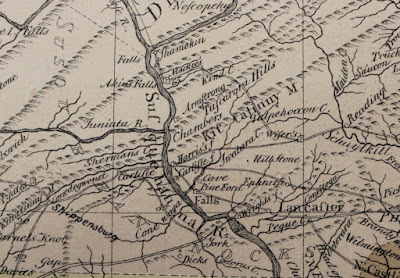 Cammerhoff’s Narrative of a Journey to Shamokin, Penna., in the Winter of 1748”. The Pennsylvania Magazine of History and Biography, Vol. 29, No. 2, pp. 160-179. 1755 A General Map of the Middle British Colonies in America. Evans: London. 2015 Private collection of photos and documents at Fort Hunter Park. 1985 The Indian Trade in Colonial Pennsylvania, 1730-1768. Ph.D. Dissertation, University of Pennsylvania. UMI Dissertation Services. 1896 Commemorative Biographical Encyclopedia of Dauphin County, Pennsylvania. Chambersburg: J.M. Runk & Company. 1846 The History and Topography of Dauphin, Cumberland, Franklin, Bedford, Adams, and Perry Counties. Lancaster: Gilbert Hills. 1996 Conrad Weiser, 1696-1760, Friend of Colonist and Mohawk. Lewisburg: Wennawoods Publishing. 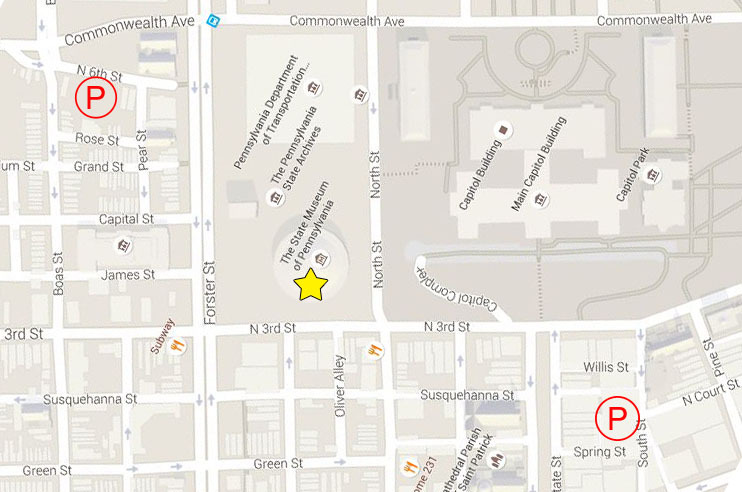 Due to the Grand Review procession through downtown Harrisburg on November 14th in observation of Veterans Day and the 150th anniversary of the end of the Civil War, the parking situation for our Workshops in Archaeology has changed. Note: parking fees have been waived for the Grand Review events taking place on Saturday. Turn Left onto Commonwealth Ave. from Forster St.
At Boas St. (the first intersection), take two immediate lefts (wide U turn), the church parking lot should be on your left and the 6th St. parking lot (with a low brick wall) on your right. 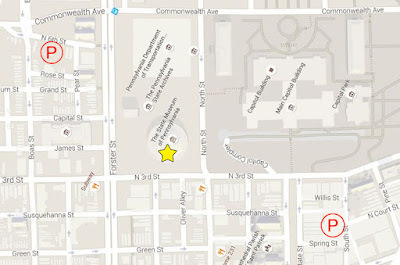 Turn right onto Boas St.
At the first intersection, take the second left. The parking lot (with a low brick wall) will be on your right. Much of what we know about Native American plant husbandry is the result of many years of specialized investigation through the archaeological recovery process of separating carbonized debris from pit soil via water immersion. 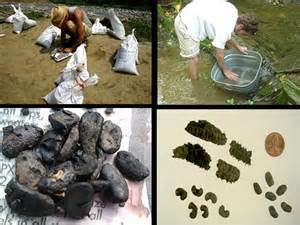 This process is called flotation the principal method used by archaeologists and paleo-ethnobotanists to recover plant parts, especially seeds and other small fragile remains from archaeological contexts. Through flotation, specimens are recovered, identified and studied to better understand the subsistence behaviors of the people who consumed them. 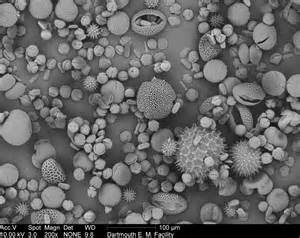 Additionally, starch and pollen grains and phytoliths are minute residues associated with prehistoric diet. Thus, through a careful detailed study of these plant related components, hidden information is revealed relating to human diet. On a regional, level this research has broad implications that have the potential to greatly enhance our understanding of cultural adaptations and plant use/consumption of prehistoric native groups who once occupied the Pennsylvania landscape. At first blush growing crops from weeds may seem a weird concept but cultures around the world have been doing just that for thousands of years. 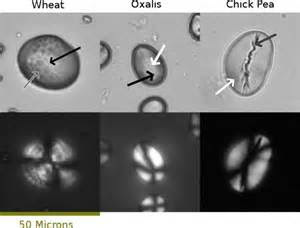 Take for example the food patterns of early Meso-American societies where various strains of grass, by way of eco-human modification and natural selection developed into the primitive form of maize called tseosinte. Over time this crop food, became the flint and dent varieties of maize. Along with beans and other Mesoamerican derived plant foods likely spread into the Mississippi Valley and on to other parts of North America at an early period where they became valuable food products in the Native American and Euro-American diet. Gourds were grown in the central Mississippi valley around 4500 years ago and gourd rinds dating approximately to this period have been recovered from archaeological contexts in the central Susquehanna valley at the Memorial Park Site. Certain weed seeds carefully selected for their robustness and nutritional qualities were replanted setting the stages for incipient Eastern North American horticulture. Though archaeologically unknown or rarely identified for much of Pennsylvania other weed crops were Amaranthus a.k.a. pigweed ,Chenopodium a.k.a. goosefoot, Iva a.k.a. marshelder and Helianthus a.k.a. sun flower among others. Horticulture or garden farming played a significant role in the sustainment of a dependable food base. Climate fluctuations occurring at certain periods in human prehistory/history, caused by uncontrollable rises and declines in solar activity, volcanic eruptions and trade wind temperatures, bore directly on ocean current patterns. Some or all of these factors were contributory to the Little Ice Age and the Neo-boreal climatic period between 1350-1850 AD. Their lasting effects were felt in many parts of the world until the early 19th century when conditions again improved. 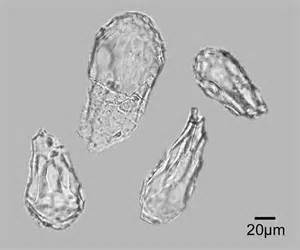 Until the arrival of domesticates with modifications in the environment human plant food consumption likely did not change much though some plant foods were only available seasonally. Foods such as berries and a wide range of nuts only ripened during certain times of the year (i.e. the fruiting season of summer and the nutting season of late autumn). In their absence edible parts of soft stemmed plants that emerged in early spring were processed and eaten along with roots and tubers from mud banks and wetlands. The latter of which were accessible over much of the year. Some of these plant products thus harvested were eaten directly or stored for later consumption added variety to the daily menu of native people. The appearance of maize (circa 800 AD) and beans (circa 1300 AD) on Pennsylvania’s prehistoric landscape significantly contributed to changes in Native American demographic patterns. Small habitation sites grew into large fortified settlements supporting many people. Surrounding many of these settlements were extensive agricultural fields where corn, beans and pumpkins were grown. For much of Pennsylvania this subsistence strategy lasted until the system collapsed and many groups were dispersed in the mid-17th century when foreign diseases arrived and Europeans focused their economic pursuits on land acquisition and the extraction of native resources. By the early 17th century elements of the native diet were adopted by European immigrants and their presence can still be seen on the modern day dinner plate. This has been a brief introduction on the use of plant foods in the Keystone State from “weed seeds to garden seeds”. The 2015 Annual Workshops in Archaeology Program is only a week away. This year’s theme is a topic of wide interest to many Pennsylvanians beyond the archaeo-botanical community. Experts with special fields of interest will be presenting and you can view the program by clicking on the program banner to the right at the top of this post. We hope to see you at the workshops on November 14th.